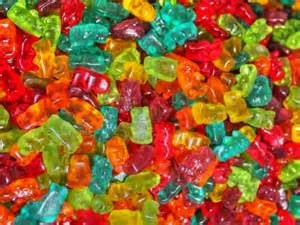 ToddlerFoodiesATL: What's Up With These Gummy Bears? ~Did we like the food? ~Did the grown-ups like the food? ~Was there anything special about the restaurant (free parking, complimentary treats, one-of-a-kind theme, etc.)? 0 Gummy Bears = Tantrum throwing ensued when we left the restaurant (toddlers and adults). 5 Gummy Bears = We fell asleep as soon as we got into the car because we were so full and happy (toddlers and passengers only). Hope you all find our Gummy Bear ratings helpful! Happy eating!